Simulator of the airport, where our main task is to coordinate the movement of aircraft on the apron of the airport and the maintenance of aircraft. 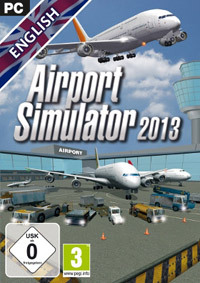 Airport Simulator 2013 is an airport simulator, where we deal with complex service of aircraft appearing on the airport grounds. This process begins as soon as the aircraft lands on the apron and ends with the machine leaving the runway. The creators have prepared 26 different tasks, during which we will deal with practically every aspect of the proper functioning of ground air traffic - it is our responsibility to ensure an adequate number of people in the cabin crew, replenishment of catering supplies, towing the aircraft to the parking place and its refuelling. In order to achieve our goal, we use seven specialized machines - in addition to vehicles for aircraft guidance or food transport, we also operate a sleeve or de-icing machine, which allows us to prepare the machine for departure in severe frost. For fulfilling the next goals we receive special tokens, which can be exchanged for various improvements to improve the work at the airport. We carry out our activities in dynamically changing conditions, because the airport is vibrant with life - from time to time take-offs and landings take place, and on the apron various vehicles and planes drive to the final destination. Weather conditions have an impact on the effectiveness of the activities - conducting airport operations in rain streams or snowfalls is much more difficult and takes a little more time. Apart from a few dozen missions that make up the main campaign, the creators also tried to prepare a tutorial, which comprehensively presents all the nuances of the game. In addition, a free game module was given to the hands of players, where we set the goals and tasks of the session created by ourselves. The game's visual setting represents the level characteristic of the simulator genre. Attention is drawn only to the refined models of aircraft and machines necessary to carry out airport operations.